A stroboscope, also called a strobe, an instrument that produces regular brief flashes of intense light, used to study periodic motion, to test machinery, and in high-speed photography. Stroboscopes usually have a calibrated scale from which the number of flashes per minute can be read. When the flash frequency exactly matches that of the rotation or vibration, the object is illuminated in the same position during each cycle, and appears stationary. 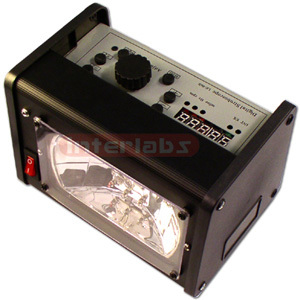 A gas discharge lamp is used, with flash duration about 1 microsecond and frequency from 2 to 3,000 hertz.